If you're looking to find a great place for a Hawaiian cookout or picnic, look no further. 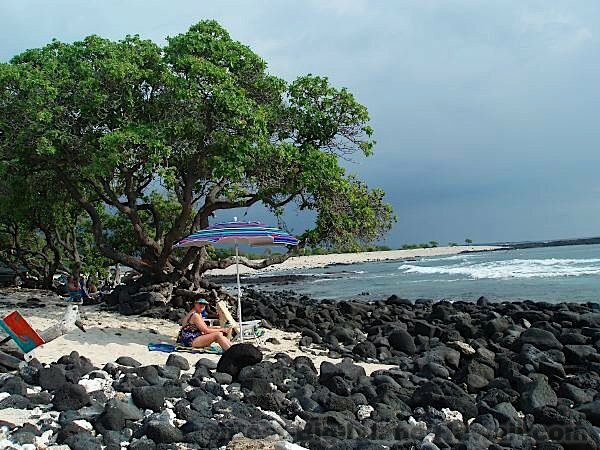 Pine Trees Beach is not too far from Kailua-Kona on the Big Island's Kona Coast, but is off the beaten path enough to make it seem remote. The name Pine Trees is a bit of joke because there aren't any actual pines here. Apparently, someone thought that the mangrove plants behind the beach were pines and the name just stuck. Regardless of the accuracy of the name, this is a beautiful spot to enjoy the ocean. Getting to Pine Trees Beach requires a 4 Wheel Drive vehicle. Take the road towards the Natural Energy Lab off of Highway 19, just South of mile marker 94. The road towards the ocean is paved and will take you to the Wawaloli tide-pools area before it turns right towards the Energy Lab. This tide-pools area is another popular BBQ and picnic spot. To get to the beach from here, turn left where the Energy Lab access road comes to a "T" (paved part continues to the right). Follow this "road" South along the coast for a mile. At first it's not too bad, but it gets worse. You need a 4 Wheel Drive here. The road branches off in a few places, but all routes basically lead the same direction. Though some are easier than others; use your judgement. Any spot along this road is great for enjoying the view, but the best location is the last large bay (about a mile in) at the end of the road. As you approach this bay, you'll see a tent where the people who take care of and manage this area are set up. Give a friendly wave and keep going. No need to stop. If you're interested in camping here, talk to these people. Overnight camping is only allowed with a permit. Talk to the caretakers for more information. If you're here on a weekday, you might just about have the place to yourself. More people tend to show up for a surf after work. On weekends (especially holiday weekends) Pine Trees can become much more crowded, but even with lots of people, it's a great place to be. (Note: Most of the pictures on this page are ones that I took on weekend or holiday trips when it's is more crowded). The sandy beach here is a great place to relax, but most people only go in the water to surf. In the water, the bottom is mostly rocky and isn't very good for swimming at all. 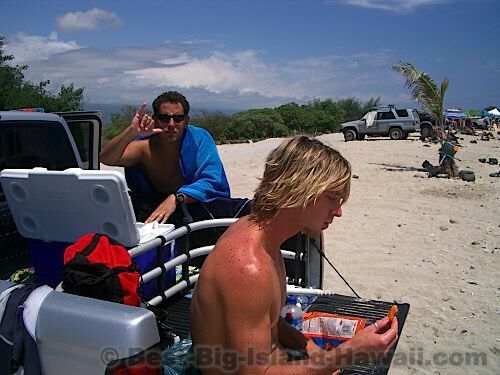 For more information on surfing here or elsewhere on the Big Island, check out our Big Island Surf Page. Other than surfing, I love sunset grilling at Pine Trees Beach. You can park right next to your favorite spot, so it's easy to bring all the gear you need. Open fires are not OK, but portable gas or charcoal grills are fine. My favorite is fresh grilled Ahi (Tuna). Bring along your BBQ favorites and enjoy a cookout by the ocean. There are no tables here, so bring along everything you need to enjoy yourself. 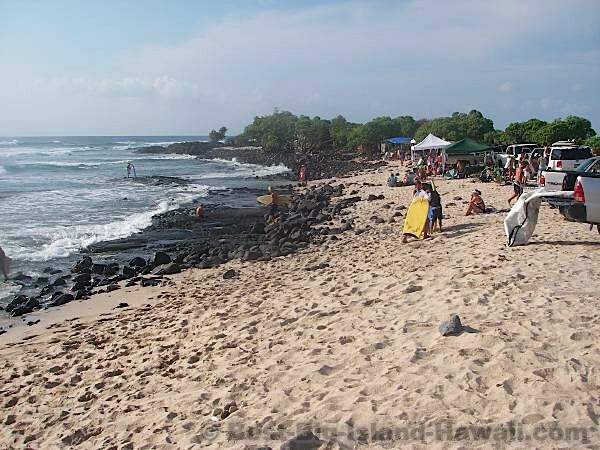 As with all beaches on the Big Island, remember to leave your spot as you found it. Take all your trash back out with you. Don't leave used charcoals on the beach or in the ocean. 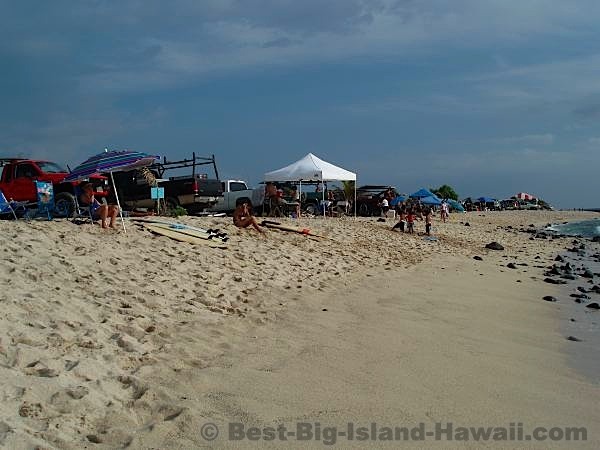 Pine Trees is a beautiful spot for a Hawaiian BBQ picnic and everyone wants to keep it that way. Accessibility: Access via a rough, unpaved, 4 Wheel Drive Road. 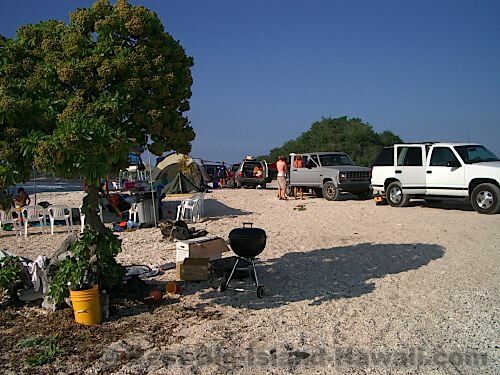 Parking: Park along the road behind the beach or in shady spots between trees. Swimming: Poor. Lots of rocks. Facilities: Portable toilets. Restrooms and showers at tide-pools area near where the 4-Wheel Drive road begins. Picnicking: Lots of space. Bring your own gear. My Favorites Here: Surfing followed by a sunset cookout. Watch Out For: Rocks and sea urchins in the water.